Umm, fellas – it is very telling when you opt to not directly reply to my post but still talk all "around" me with such random and irrelevant remarks. Just thought I should let you know that you're fooling no one. Goodness gracious me, this saga with Mr.Bush gets weirder by the minute. And any fantastical thoughts of getting reelected to office certainly haven't been helped by this latest development. Even his most ardent supporters must realize that. It really is long time overdue for Mr.Bush to accept that he's had his day (including some 17 hour ones, apparently!) as a public figure and bow out quietly into the sunset. You are so wrong!! Mack is even more stronger now. People throughout the Country who never even supported him is doing so now. After all give Caesar his due, that he and the late Jim Bodden is the only true two Politicians in the Cayman Islands with guts and will take a stand.This time around like I hear it said so much recently, Mack will have a land slide victory. We anticipate that he has a very good George Towner that we would like to see as Premier and Mack the speaker of the house. Dont worry , while you are sleeping Mack is planning. A Great man. Thank you for your response but I fear you are clutching at straws if you anticipate the vast majority of the people of the Cayman Islands placing their confidence and trust in Mr.Bush in future elections. They would have needed to have been asleep during hs recent trial to do so, surely. But let us see, miracles happen, and meantime let us pray Mr.Bush obtains the much needed professional treatment for his addiction to gambling. Yeah, we all didn't expect him to get in last time either, please don't forget it is up to the bayas. An addict is an addict, it doesn't matter who you are, and addicts are inherently unreliable and untrustworthy individuals who often have a problem with the truth. I'm sorry, but that is how it is. Ask any professional who treats them if you doubt my words. Do you imagine the Caymanian public are somehow unaware of this reality about addicts or are fool enough to think it matters not in regard to who they elect to leadership positions? If you do I reckon you and your fellow supporters of Mr.Bush are desperately in need of a reality check yourselves! Drowning men will cling to even a straw and foolish dogs, bark at flying birds. Get in toruble with the law and you shall surely spend your last farthing. Oh, "your last farthing" – I thought you said something else at first! Misick, Bushsick and Whodatisick. These guys are like ignorant teenagers who hate their parents because their parents lay down rules such as, do well in school, no drinking and smoking, pull your pants up, act civiilly. To Nevermind the fact that the parents have been through this all and know better. Alas, at least one ignorant 'sick" is going to write "But we have the right to make the same mistakes too". Nevermind how stupid such a comment makes one. Didn't realize I was a leader of a country – you seem to be confused. Anyway, I now only have two words for you; "war criminal". If one word is "Chagos" and two words are "war criminal", then what do you do for three? "Chagos war criminal" perhaps? That is the star prize of both the George Foreman grill and the dual rotisserie oven right there! Not been won since 1997. You must be the biggest ediot in the Cayman Islands or where ever you are from. Can't you see the munipulation of the UK in that case? I hope that you become a victim of their conspiracy very soon and I will wait to hear what you have to say then. It seems to me that if our OT leaders conduct themselves with ethical integrity they would have little to fear. That's often what they tell the populance. The UK no doubt have it's problems….but I cringe to think where we might be without some UK oversight. Additionally,the specifics of these cases have some glaring differences….also by Missick running away only adds more suspicion. Re: "The UK no doubt have it's problems…"
That's one way to put it I guess. The affairs of TCI and GCM have some similar elements but are entirely different. We know the outcome of GCM. 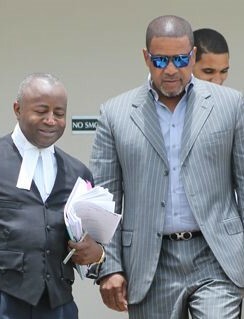 The TCI saga is yet to be tried in court and as a result the verdict is unknown. What concerns me most is the refusal of the UK government to let the TCI defendant have his right to a trial by jury when the UK is the one that appoints the judge in the trial. Where is the fairness and transparency in that? In my opinion all these trials are just pieces on a chess board played by the elected arm of the UK parliament. A cooling mechanism to show charasmatic leaders within their terrorities that the UK still have the ultimate power. Next time, quit dabbling in petty things like money games, Vegas casinos, D-list celebrity spouses, alleged corruption and such. The big lotto is in the war crimes / prop-up-then-pull-down-a-dictator / kill half a million people / lie and illegally invade a foreign country gigs. Just look at how the British PM in question is living at the moment. International property portfolio, talk tours, chairman of a oil company based in the very country that he illegally invaded – and not a court trial or copper in sight … this could be you fellas!! Get with the freakin' program man! What's worse than an endorsement from Misick? Two endorsements from Misick. From the horse's mouth! The circus gets freakier by the day. Happily, this does not help Mr Bush much. If I am erecting subtle (in my view) arguments with the Internal Revenue Service that everything I do is above board, I am not assisted if Al Capone makes a big public pronouncement of solidarity and commonality of purpose. Yea, "birds of a feather flock together"!!!!!!!!!!!!!!!!!!!!! Don't insult the birds! They're decent law abiding citizens. Which one was coaching? Misick I am sure was the coach. Similar land sales or give aways. Could that be coincidental? Clean hands and a pure heart, needed private security and medical incidentals in the casinos. It did not prove innocence but rather legally there was no case. 16:25 However you want to state it as a matter of semantics the man was found innocent by a jury of his peers. Operative word "NOT GUILTY". Get over the verdict and go find another cause there are many to choose from …. lets start with unemployment and the regression of the Native Caymanian way of life. The regression in the Native Caymanian way of life started when we decided to overlook morals for finacial gains, and when we piu people like Mac on a pedestal and became his followers. When are we going to get back to having leaders with impecable moral standards? On one hand we sit and complain about how things are so tough for our Camanians but we dont see that the leaders we elect and follow are not of a good morall character, where do you think as a society we will go but down? Top on the agenda, should be Nation Building Fund. Investigate, investigate. You fool. The National Building funds was investigated as well and it turned up "0." Or how about the Ritz Carlton commissions and planning variation, the Stan Thomas letter, the Ritz tax repayment moratorium, the Cohen refinancing, the dynamite intervention….As you say, plenty to choose from. 13:49 Yesterday's news stop living in the past, today is even almost gone… live and think for tomorrow because there is nothing you can do about yesterday except don't repeat the same mistake tomorrow… now go help the Caymanian people get jobs so that tomorrow they don't have to rob and steal to eat… jobs so that they can pay their bills to have a roof over their head, lights and water to take a bath and drink. You forgot the First Cayman Bank fiasco. Agreed, let's start round 2 immediately. Hopefully there will be another knock down or a knock out. I doubt this fight will go the full 12 rounds. He was not found innocent. The jury determined there was not sufficient evidence to establish a finding of guilt beyond all reasonable doubt. That is much more than semantics. I do hope the people of these islands can wake-up and see the bigger picture before it's too late. There is only so long Mckeeva Bush can be the scape-goat for the U.K's dirt. You know these things how? Because Mac said so and you believed him? I am sure my neighbour has a secret transmitter in his attic. I have heard Morse code being tapped out probably to a secret receiver in London. There are also a lot of people coming and going on bicycles. Maybe it is time that the law was changed. Any permit renewal will come with random house searches for transmitters, codes or any material connected to the resistance movement. Missick's and Bush's commonality; well isn't that something to laugh about! Note: "The corruption investigations in TCI stemmed from a report which had identified systemic corruption in the country in 2008 WHICH LEAD to the suspension of the country’s constitution and direct British rule for over two years." WHICH LEAD, but it never had to lead to this / Just to show what modern colonialism is about. Although Misick may have truly been corrupt, they deliberately suspended the country's elected LA, the people's Constitution, swapped the democracy for a dictatorship. Do you see what I mean? They could have prosecuted the man on his own soil without going to lengths about it. Just when TCI was becoming prosperous, they declared full rule, the MPs in the UK watched, and business owners were intimidated. They deliberately reduced TCI back to 100 years and say it was good for the country. MODERN DAY COLONIALISM AT ITS BEST! Yes 15:53, that's right! SPOT ON! Too right. There I was, 10 years behind the bell as a fully qualified leper and up pops the UK and cures me. Takes away my livelihood with not even apology. I lost everything thanks to the UK. Bloody do holders! That's right the UK is ridiculous they need to be exposed!! Be specific, it's the Monarchy that needs to be exposed. LMAO, because it will NEVER happen. In letters ten feet high all over the Public buildings.